If you're a fantasy owner who would gladly welcome a dual-eligible forward who is putting up nearly a point per game, then look no further than Colin Wilson. Wilson (owned in only 15 percent of Yahoo! leagues) leads the Predators in scoring with 14 points in 17 games this season despite a widespread perception that he's a fantasy afterthought. 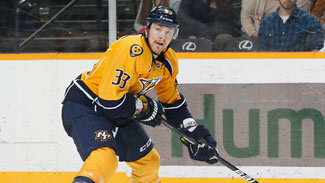 The C/LW eligibile forward had a pair of assists in the Nashville Predators' 4-3 overtime win over the Detroit Red Wings on Tuesday, extending his point streak to five games (2 G, 5 A) -- the most balanced scoring stretch of his career. The 23-year-old had his share of critics after failing to emerge as a top-tier point producter after being selected with the seventh pick in the 2008 NHL Draft, but he is finally finding his rhythm in the Music City. Wilson did produce 30-plus points in each of the past two seasons, but -- outside of deep leagues -- has never been considered a viable fantasy option until now. The Predators' most frequently used even-strength combination this season has been Wilson's line with David Legwand and skilled distributor Martin Erat, giving him the opportunity to emerge as the team's top threat on the front line. He's also earning the most power-play ice time of his career (2:44 per game), turning in four points already with the man advantage. Wilson is the perfect player to take a flier on while you store injured forwards on IR. He's far from a proven point producer, but having youth on his side certainly makes his situation promising. He already has four multi-point games this season, indicating he may be taking the next step toward being a more explosive scorer in this League. Through 17 games this season, Nashville has the NHL's second-lowest goals per game average (2.18). The team doesn't have a surplus of dynamic scorers in the fold, meaning Wilson is in a place where he's likely to be granted ice time in many different situations if he continues to show promise. Thus, taking a flier on Wilson while monitoring his usage by Preds' coach Barry Trotz is the best course of action for any fantasy owners in dire need of a scoring boost.